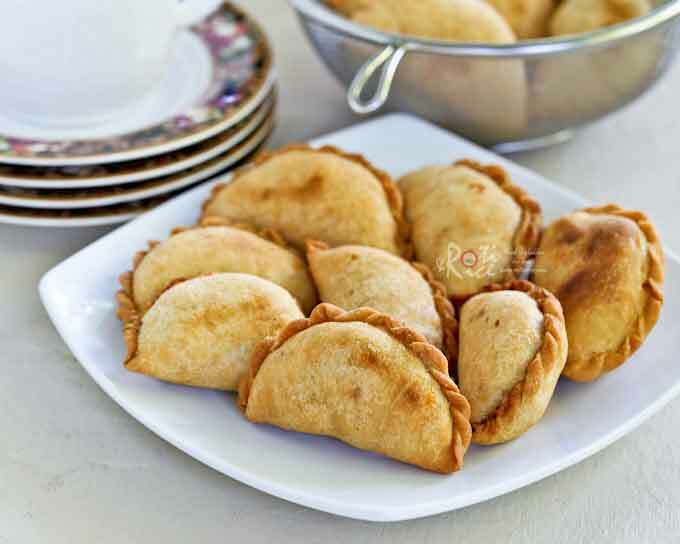 These vegetarian Karipap (Malay Style Curry Puffs) with curried potato filling are a popular Malaysian snack. This version comes with a smooth flaky crust. 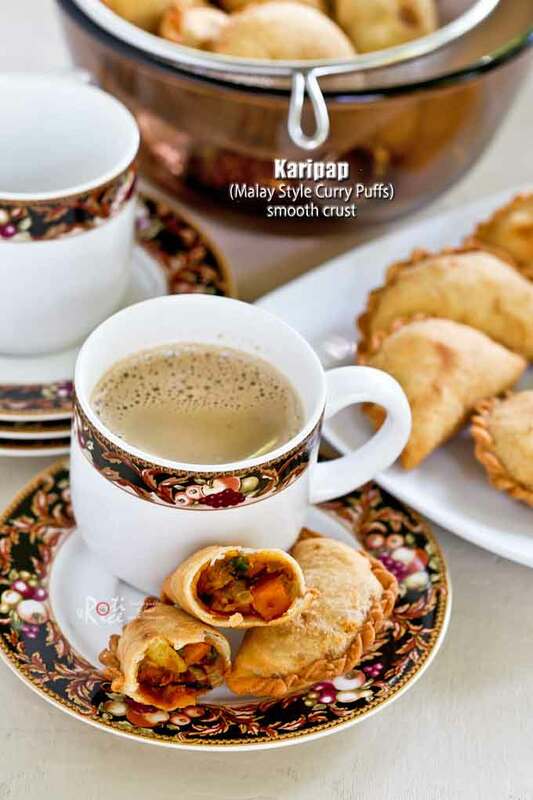 I think I can safely say that most Malaysians love curry puffs because I have yet to meet one who does not. Hence, like all popular food they come in different versions. The filling is more or less the same – curried potato with or without chicken. The crust or pastry however, comes in different forms. 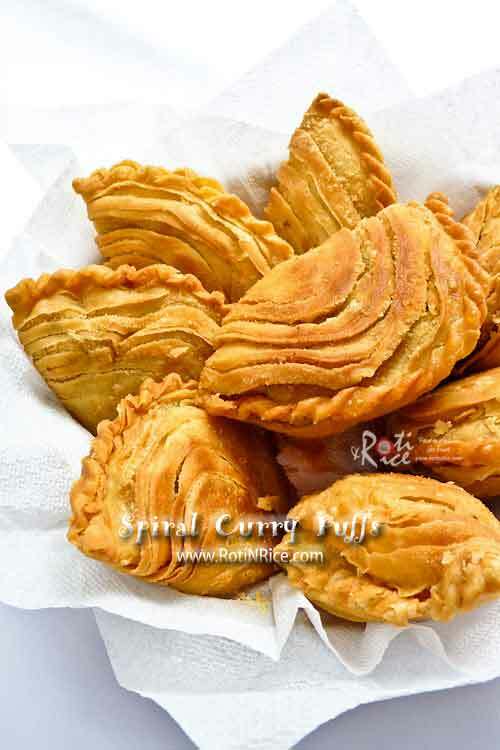 The “king” of curry puffs are the spiral curry puffs, so called because of its beautiful layered pastry. These are usually quite large, almost the size of one’s palm. The curried potato filling normally comes with chicken. In our family, we have also made it with shrimp which is amazingly tasty. Then there are those curry puffs sold at the bakeries and mall made with puff pastry. These are more like mini pies or tarts and probably came about out of convenience. They are usually rectangle in shape. No pleating, which is definitely a time saver. Perhaps the most ubiquitous of all curry puffs are the Malay style Karipap found in school canteens (more commonly known as cafeteria here in the US) and kuih (snack) stands throughout the country. Ask any school going kid in Malaysia and many of them would have tasted a good number of Karipaps during school recess. I had my share of it when I was in school. They were tasty, inexpensive, and quite filling. In Singapore, the same is called Epok-epok. A popular version there comes with sardine filling. Back when I was a kid, the Karipap filling itself tasted sweet because sweet potatoes were used instead of regular potatoes. I believe at that time, sweet potatoes were cheaper and more abundant. There was no meat. Just sweet potatoes flavored with curry spices and the unmistakable scent of Chinese celery giving it a distinct flavor. 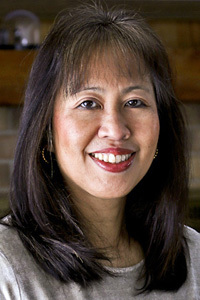 The Malays call Chinese celery daun sop which they also use in their sop kambing (mutton soup) and various other dishes. I prefer my filling to be a little less sweet and so in the recipe below, I have decided to use a 1:1 weight ratio of regular and sweet potatoes. Since Chinese celery is not easily available here, I used cilantro instead. The flavor of cilantro is milder but it will have to do for now. For one who specializes in spiral curry puffs, reproducing the Karipap crust required some experimentation to get it just right. The first time, the crust came out smooth after deep frying. As far as I can remember, school canteen Karipaps had blistered crusts. I had a hunch on what was needed to make that happen and so I made a second batch the next day. I was spot on. 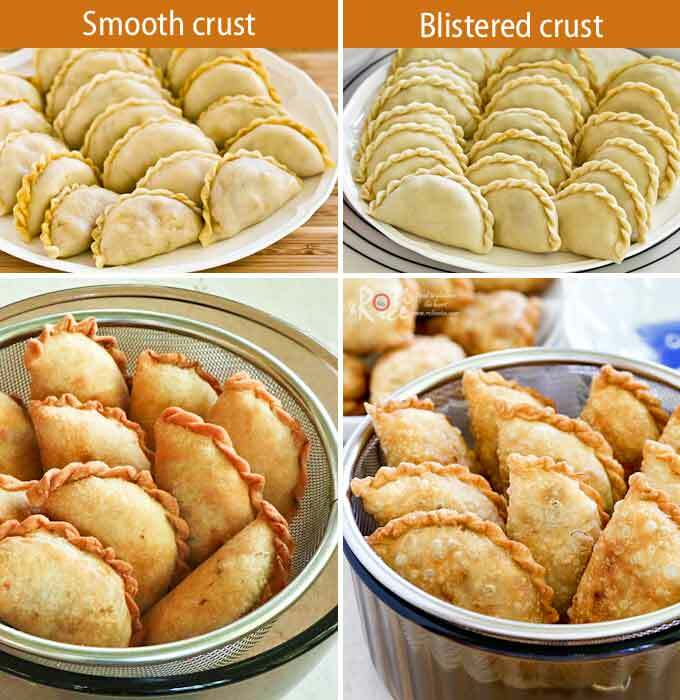 Here is the link to the blistered crust recipe –> Cafeteria Style Karipap (Curry Puffs). 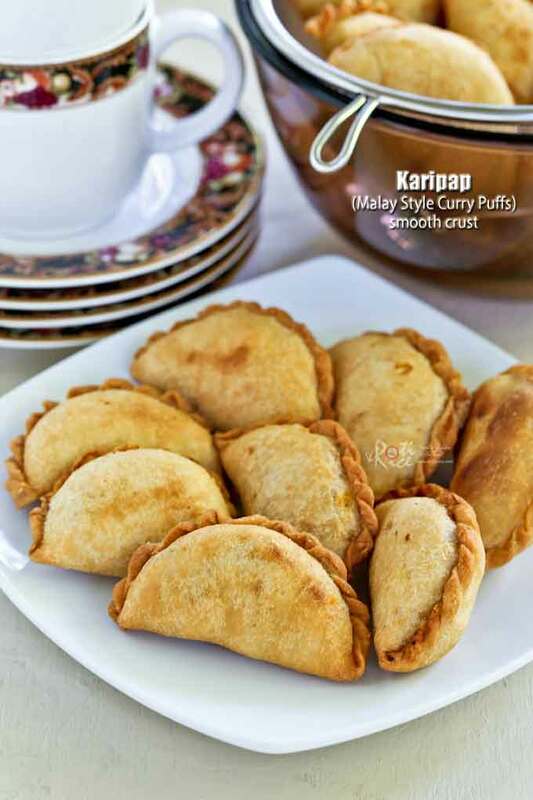 These vegetarian Karipap (Malay Style Curry Puffs) with curried potato filling are a popular Malaysian snack. This version comes with a smooth fluffy crust. Boil scrubbed potatoes and sweet potato in medium saucepan. After 15 minutes, remove potatoes. Allow sweet potato to cook for another 5 minutes. Remove and allow potatoes to cool. Peel potatoes and cut into small cubes. Heat vegetable oil in a fry pan over medium heat. Saute onion for 1 minute. Add curry powder and continue to stir for 2 minutes until curry powder is fragrant. Add cubed potatoes and sweet potato. Stir to coat potatoes with spices. Pour in water and season with salt. Add chopped cilantro and continue to stir to get everything well mixed. Turn off stove. Transfer to a bowl and allow filling to cool. Combine all-purpose flour, salt, and margarine in a large bowl. Mix with a spatula. Slowly add water a little at a time. Knead to form a soft, non-sticky dough. You may or may not require the full ½ cup (120ml) water. Continue to knead the dough in the bowl or on a clean work surface for 3 to 4 minutes until smooth. Form dough into a ball and place it back into the bowl. Cover with a towel and allow dough to rest for 15 minutes. Remove dough from the bowl onto a lightly floured surface. Roll out dough to about 1/8 inch thick. Using a 3½ to 4 inch diameter lid or bowl, cut out as many circles as possible. Knead the edges back into a ball. Roll it out and cut more circles until all dough is used up. Place a piece of dough on your palm. If it has shrunk a little, spread it out gently with your fingers. Place a tablespoon of filling in the center. Fold the dough into a semi circle. Seal by pressing and pleating the edges together. Repeat with the remaining pieces of dough. Heat about an inch of vegetable oil in a saucepan. Deep fry karipap over medium heat for 3 to 4 minutes or until golden brown, turning once. Remove and allow karipap to drain in a metal strainer. 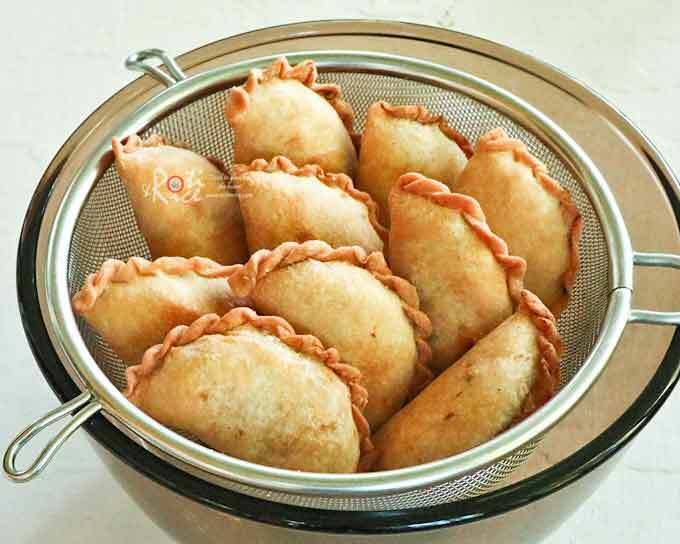 To make ahead, shape karipap (curry puffs) and store in the refrigerator the day before. Deep fry the next day when ready to eat. Thanks for the vegetarian curry puff recipe. This looks tempting, I will give it a try soon. Can I ad equal quantities of potato and sweet potato and increase the curry powder? Will it taste sweeter? Yes, you can use equal quantities of potato and sweet potato. The taste will be just fine. i was hit by a deep and abiding longing for my grandma’s karipap today. very glad i found your recipe! will be giving them a go soon.